Animated series. The riders save a deathsong egg from dragon hunters, but they have to take it back to Melody Island when the hatched baby won't stop crying. Browse content similar to Tone Death. Check below for episodes and series from the same categories and more! OK, gang, stay with your team-mate and lock down your specific island. This Dragon Hunter is sneaky. and slips out under the cover of darkness. -Very boring. Can we get to it? 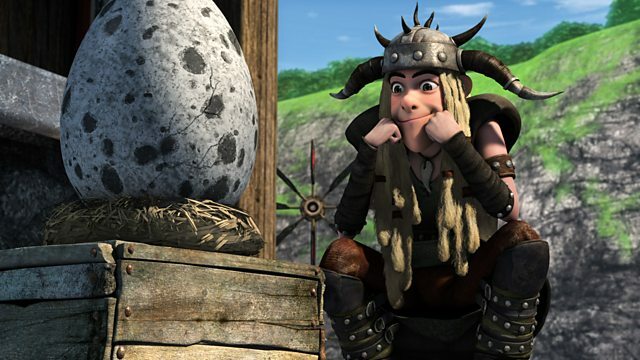 -So, I need you to put in a good word for me, Hiccup. -Please! I'm so over Astrid. You can have her. -Any time. I'm a giver. but her fear has got her...'scurred'. Yeah, I don't think Heather gets 'scurred', Snotlout. Besides, I'm not so sure you're ready for a woman like Heather. I can fake sincerity. I can fake all those things. Oh, yeah, and by the way, she's smart, too. I can fake being smarter. Keep it nice and warm. This one is a beauty. Guys, we need to protect the egg, not fry it. We're never going to get out of here! It's the egg they want. They want the egg? Give it to them! Get ready to move, guys. -Back off, twidiots, it's mine. Well, that was fun. Hey, I've got an idea. How about we get this back to the Edge, safely? -It's definitely not a Changewing. And it's not the type of any of our dragons. Oh, can you imagine Meatlug with her very own egg? It would be so cute! I don't think it is in here, Fishlegs. Well, someone certainly has their ideas on what it is. Aren't you, little chicken? Give me a kiss. Ow! Easy, pal. I'm on your side. a little bit more power than that, Chicken, but it was a nice try. Don't listen to him, Chicken. Haters gonna hate. -We should check the Dragon Eye notes again. Just to be sure. But I didn't see anything in there about eggs or hatchings. -Why didn't you say something? -It's familiar but I can't place it. Who liked him better when he was inside? Can someone please shut that thing up?! Oh, it probably needs its mother. Poor thing. All by itself. That's what I was trying to say because I'm so sincere. Of course, these fools don't listen, but I listen. -Who cares what we call it? It's not like it's listening to us anyway. Chicken cares and it did come out of her. Tuffnut, she didn't actually... Never mind. with this dragon in here? feel free to babysit that thing if you want to. -Maybe I should stay with it? -That's exactly what I was thinking. We're like two yaks in a stall, you and me. under our beds, we just might be able to catch a few winks. Yeah, OK, let's just get out of here before our heads explode. Chicken, come on. It's bedtime. who took on the Buffalord. She just ain't having it. She wants to stay with Garffiljorg. -That's because Chicken sang to him. Ah, the pipes on that chicken! It's a baby Death Song, Tuffnut. Believe me, we know. -Tuffnut, could you please help me out? It's not doing any of us any good to have the entire Edge freaking out. I can't lie to a chicken! if you had some Monstrous Nightmare gel. rotisserie chicken while you're at it. Mmm! That sounds good. -You apologise to her right now, you hear me? Nobody is rotisserie chicken! Nobody! So you keep that Monstrous Nightmare gel away from her. -Actually, Tuff, Snotlout may be onto something. Remember when we were at Melody Island? Uh, don't do it, Hiccup. and that's all she has in the whole wide world, except me, of course. I'm just doing enough to get it started. I won't go deep enough to get remotely close to Chicken. See? Chicken is free! Chicken is free! You! We need to remove Garffiljorg from this island immediately. -OK, Tuff, don't you think you're overreacting? I mean, he just went after Chicken. -How long before he goes after one of us? Back to Melody Island with you. -all of us and our dragons? -Well, I had until you just brought it up. -Oh, no, no... It is too dangerous to go back. if a baby dragon can bond with a dragon that's not its parent. But, guys, he is too young to know right from wrong. He is just following his instincts. I know what it's like to be all alone in the world. We can't just shun him. to a Night Terror. We can certainly train him not to eat us. Right? -We owe it to Garff. leap off the top of the Edge? and I'm just being honest with you because I'm nothing if not honest. Did you hear that, Heather? That was just beautiful, Heather. "That was just beautiful, Heather. Oh..."
Uh, thank Thor something works. Well, would you look at that. Garff wasn't the only one it worked on. The Death Song sings to its prey to draw them in. That might be the primary way it communicates. -And it might help us train it. Well, you'd better keep singing, then. Oh, yes, of course I do. -You guys are up. Take him. He's fine. He just gets a little cranky when the music stops. OK? That's all. So, ha-ha, you're going to have so much fun. # Why must you eat my pet? # But how long, how long, how long can we keep this up? # Can keep this up? -Well, that was supposed to work. This is officially out of hand. We cannot go on like this. But we can't abandon him. We just can't. I would never forgive myself. I'm sick of rhyming with met! We won't abandon him. We'll do what we should have done to begin with. We will take him to be with his own kind. -Are you saying what I think you're saying? We are going to Melody Island to find that Death Song. So do you have a plan for that or are we just going to wing it? Pun intended! Ha-ha! Get it? handle that, Snotlout, by using these. I custom made them for each dragon to keep out the Death Song's call. Great. As this if this guy needs another reason to not listen. You didn't happen to make any for us, did you? You should take that comedy routine on the road. Except you shouldn't, because it's completely contextual. -Fishlegs, how did you swing that? I wasn't entirely sure it would work on this particular species. the little guy out. Sorry, girl. Just make sure he's awake when we get there. We need him alert and focused. How do you get a one-armed Jorgenson out of a tree? Wave to him. That's not even funny. Oh, I just got it. It is funny. How do you sink a Jorgensen battleship? You put it in the water. -Do another one. One more! That's right. Laugh, all of you. But don't come running to me when you're out of Nightmare gel. All right, gang, the Death Song's strike is very precise, streamlined. that way it can only go after one of us at a time. Hey, how do you confuse a Jorgensen? Put him in a round arena and tell him to go to the corner. -You don't even understand jokes. -Well, it's not in there. -That is good news for Garff. -And bad news for us. -The earplugs are working, Hiccup. -Great. Now, let's get in closer. I forgot how much I hate this guy. I never thought I'd be happy to hear that. Well, at least they're not shooting it at us. Hey, I think they're bonding. I knew this was going to go bad. Why does no-one listen to me? Fishlegs, what are you doing? -I'm sorry. I hum when I'm nervous. I heard they love humming in Valhalla. Hey, that's my favourite lullaby. And I was the one that taught it to Garff. Well, that might be the problem. and the Death Song doesn't like them. You know, everyone's a critic. -So what do we do? -Maybe we can find a song that it does like. I'll need some time to prepare. This golden throat is a very delicate instrument. Ah! Yep, that's it. Much better. Go on, Garff. It's OK.
-I don't believe it. Garff saved us. -Yeah, we saved him and he saved us. before they get their appetites back. make a really cool sword. Exactly. I'm going to call this Inferno. -I mean, look at it. -Nah. It doesn't have the right je ne sais quoi. All right. I will come up with something different. Of course, I will have to make some adjustments. Monstrous Nightmare gel, make the gas canister airtight. Oh, I am getting to work on this thing right away. And that's the last we will see of Hiccup this week.